Emmett Fritz was born John Emmett Fritz October 13, 1917 in Kansas City and died in Florida on November 29, 1995. He studied at Pratt Institute in 1937, and studied briefly with Norman Rockwell. 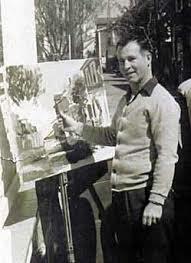 He painted landscapes in New England through the late 1930’s and 1940’s, and also worked as an illustrator and as cartoonist for the comic strip “Roxie West”. In 1950, he left New York and moved to St. Augustine, Florida, where he became an active and much-loved member of the thriving artists’ community. A prolific painter in both oil and watercolor, Fritz had great success in his own colorful impressionist style depicting Carribbean islands and particularly street scenes of St. Augustine and Palm Beach.